Sylvia Plath's copy of Howards End by E. M. Forster is held by the Lilly Library. It is the Vintage 1954 edition printed with green wrappers as is seen here and "borrowed" from a random online source. 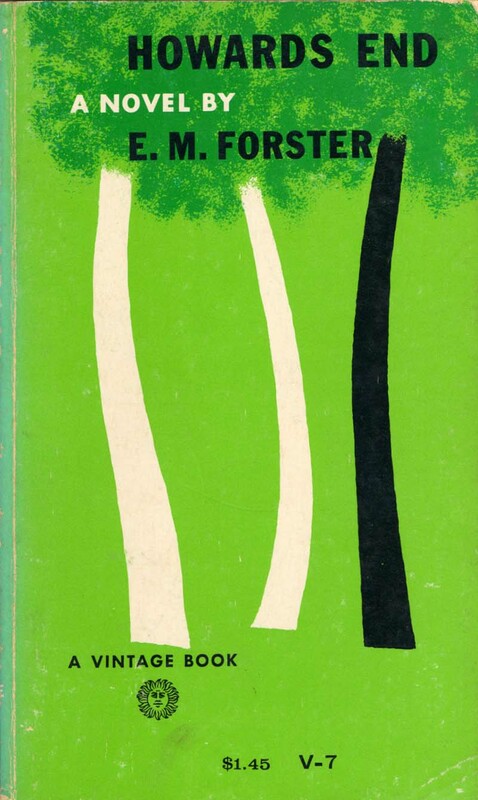 On the cover are two white trees and a black tree which form a single, combined canopy of leaves. It was labeled V-7 and the price was $1.45. When not reading or proofing The Letters of Sylvia Plath last year, I have been making my way through a list of older books that for one reason or another I was always too afraid to read; or simply never thought of reading. I read Forster's A Room With a View and liked it well enough to continue on to Howards End. Plath mentioned Howards End in a letter to her mother written from Cape Cod in August 1957. Plath's copy of the book is annotated with her usual bold, black ink pen. But also in the copy are markings in red pen, which is typical of Aurelia Schober Plath's annotation tendencies. 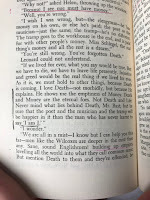 In Chapter 27 of the novel I was struck-dumb but a particular paragraph, and so I wrote to the Lilly Library to see if by chance Plath had made any annotations to it because, I think you will agree, it screams of Plath. I think I would like to call myself "the girl that wanted to be God." Yet it I were not in this body, where would I be – perhaps I am destined to be classified and qualified. But oh! I cry out against it … I am I …I am powerful – but to what extent? I am I. She later returned to the phrase "I am" in her poetry, "Suicide Off Egg Rock" (19 February 1959), and in her novel The Bell Jar (1961). 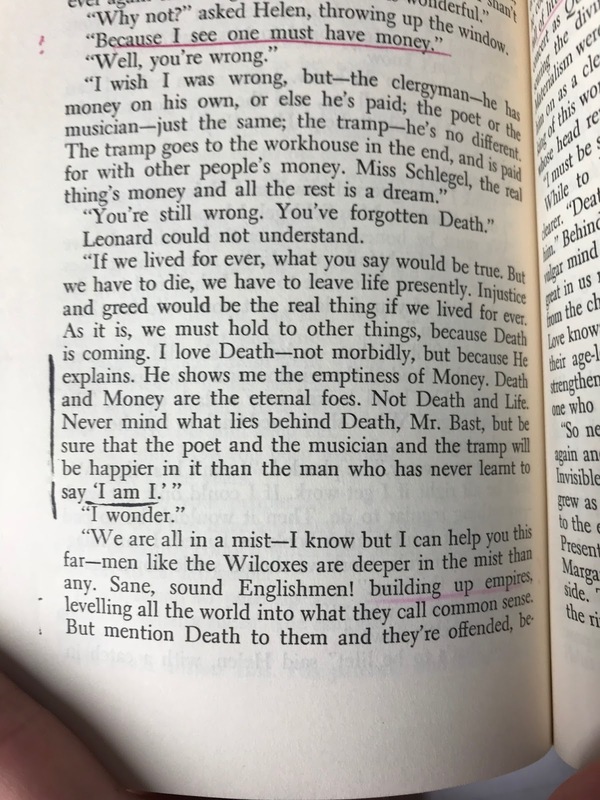 And Plath considers the concept of "I am I" several times in her published journals (entries 31, 38, 49, 78, and 188). I think Plath was channelling Forster and Howards End, too, in a short story she endeavored to write and which was mentioned in a 24 December 1960 letter to her mother and brother. She wrote that she was "beginning a longer more ambitious one today about a girl who falls in love with a beautiful old house & manages finally to possess it: a kind of parable for my loving this house with a bay tree in Chalcot Crescent" (The Letters of Sylvia Plath, Volume 2: 555). The story, if it was ever drafted or even completed, does not appear to have survived. This will make an EXCELLENT paper for this: https://victorianpersistence.wordpress.com/2019/02/08/cfp-e-m-forster-cambridge-avril-2020/ And I would LOVE to hear it in Cambridge. Please do this. And another of two Plath coincidences in my life since yesterday. I'm teaching A Streetcar Named Desire this week, and yesterday when I was reading a couple of Plath letters in the first letter volume (a habit I have developed over the past year), there it was in a letter to Aurelia from Plath's freshman year at Smith. And Forster has been on my mind this past weekend as a possible research interest this spring. Then this morning, I was assigned to supervise a Forster essay and now this. Hm.